1 of 6 In a medium-size bowl, whisk together broth and cornstarch. Add soy sauce, ketchup and five-spice. 2 of 6 If prepping ahead, pour broth mixture into ziptop bag and sliced steak into a second ziptop bag. Place broccolini, peppers, onion and garlic into another ziptop bag. Refrigerate up to 2 days. 3 of 6 To prepare, heat 1 tablespoon oil in a large skillet over medium-high heat. 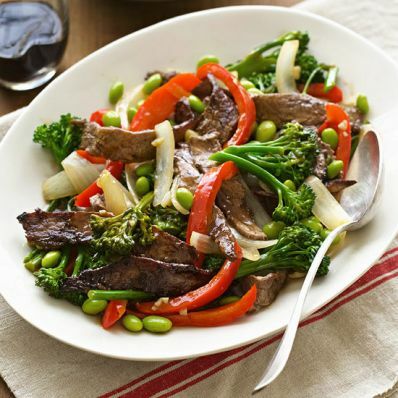 Add sliced steak and stir-fry 3 minutes per side. Remove to a plate. 4 of 6 Add remaining tablespoon oil to skillet; add broccolini, peppers, onion and garlic. Stir-fry 7 to 8 minutes or until vegetables are crisp-tender. 5 of 6 Add broth mixture and simmer 1 minute, until thickened. Stir in edamame, steak and any accumulated juices. Heat through. 6 of 6 Serve with cooked rice. Per Serving: 55 g carb., 34 g pro., 28 mg chol., 15 g Fat, total, 2 g sat. fat, 6 g fiber, 714 mg sodium, 497 kcal cal.